Affordable. Convenient. Effective Back and Neck Treatment. You may use this form to ask Dr. Cass general health questions or about your particular condition. All information is held confidential and will not be shared outside of this office. You will get a response within a day, but if this is an emergency, please call 911. *How did you find the CASS CHIROPRACTIC CENTER website? *For verification, please type the word "Health". I understand that information provided over the internet and by this site is not meant as a diagnosis and I should seek a health care physician, i.e., Chiropractor, M.D., etc. for a complete workup. * I have read and agree to the above statement. All information is held confidential and will not be shared outside of this office. The information provided in this website is not intended to be a substitute for diagnosis or treatment. Consult a licensed health care provider for further information. 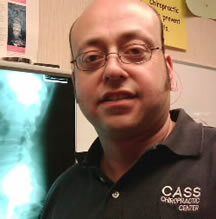 Cass Chiropractic Center is owned and operated by Dr. Steven T. Cass. Copyright © 1993-2019 Cass Chiropractic Center. All rights reserved.